Beulah Mae Snyder, 94, of Senecaville, passed away Tuesday (August 28, 2018) at Southeastern Ohio Regional Medical Center. She was born March 27, 1924 in Richlands, VA and was the daughter of the late William B. and Hailey A. (Lawson) Helbert. In addition to her parents Beulah was preceded in death by her husband Jacob Joseph Snyder Jr. who passed away in 1971. 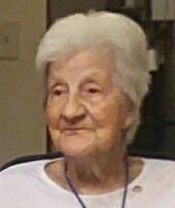 She is survived by two sons, Sandy Snyder and David (Karen) Snyder both of Senecaville; one daughter Sharon (Ernie) Green of Cleveland; one grandson Adam Green. Calling hours will be Saturday (September 1, 2018) from 11:00 a.m. to 1:00 p.m.at Anthony Funeral Home, 247 Stow Ave., Cuyahoga Falls, Ohio 44221 where services will follow at 1:00 p.m. Burial will be in All Saints Cemetery, Northfield.